While on a plane flight, I watched an episode of the American TV crime drama “The Blacklist”, staring the brilliant James Spader. Besides enjoying the taut suspense, I was intrigued by an apparent power that Spader’s character had: he could suppress the terrible memories of people he wanted to protect. How’s that for an amazing ability? Imagine if a real person could do such a thing? It certainly didn’t make Spader’s character, FBI fugitive Raymond Reddington, a happy person. So would a real life person use such a power? Well, prepare yourself for a little controversy because a real person DOES have that power and uses it all the time. His name? Jesus Christ, whom serious Christians believe is the son of God. More than 2,000 years ago, Jesus was physically on this earth, walking around Israel with a band of rag-tag followers and telling anyone who would listen that God was not a far-off, angry entity. He was (and is) in the hearts and minds of anyone who would welcome Him, passionately loving that person and offering them an eternal place in Heaven. The problem? This perfect God could not, and cannot, stand the “sin” that you and I commit. That means the wrong things we do every day and the right things we fail to do every day. That means turning our backs on God and living like He doesn’t exist. God sent Jesus to fix that through an extraordinary process: Jesus, who was (and is) as perfect as His Father, became our sin eater, absorbing our misdeeds and taking the punishment for them by dying on a Roman cross. Anyone who believes in Jesus and follows Him has their sins absorbed and their soul made pure through his sacrificial death and resurrection three days later. This means when this life is finished and His followers appear before God, the wrong things they’ve done and the right things they’ve failed to do are wiped out. Jesus followers are as pure in God’s eyes as Jesus Himself. This strikes me as a pretty good deal. That’s why, after much consideration, after reading many books and after debating with some brave Christians, I decided to accept that deal. So Jesus lives in my heart and mind. The more I listen to His leading, the better my life is. This same deal is available to you, no matter what you’ve done (or not done), no matter how dark (or light) your soul may be. At first I was reluctant to interact with this atheist person, who was commenting on a Frank’s Cottage essay (and the graphic to the left), and you’ll realize it in my initial responses. All too often, I’ve been disappointed to find that people who believe there is no God simply want to score points and win debates over people they look down on. Jill: I think the topic of sin is interesting. From my perspective, the graphic is meant to show that in order to sell the “cure”, you have to make people believe they are sick, right? Pharmaceutical companies have figured out the same thing. They want to sell more drugs. What better way to sell more drugs than to convince people through commercials that they might have a whole list of diseases which they pitch all over media. And by reinforcing the sin/sick concept over and over it keeps people flocking back to church or to their doctors for the cure. I believe there is a big difference between the word ‘sin’ and words like ‘mistake’, ‘error’, etc. They are not interchangeable. Frank: Thanks, Jill. Guess it’s a matter of perspective. Jill: Isn’t sin the hook which churches use to keep people returning each week? Christianity is based upon original sin. Frank: Perhaps that’s the perspective of some non-Christians…. Jill: I really resent watching people being told they are broken. I sometimes wonder if there is any data to link religiosity to depression. There is no perfect standard by which we should be judged. Frank: Yes, your resentment would be expected in the non-believing world. And for me as a follower of Jesus Christ, there absolutely is a perfect standard by which we should be judged. Jill: Do you ever feel depressed to be compared to a perfect standard for which you will never meet? Jill: I’m glad to read that, Frank. It makes me feel a little better. But why sin then? If God sees you as he sees Jesus, why is sin such an important part of Christianity? Frank: Great questions! Why sin? Because of the gift of freewill. Serious Christians believe God knew this would be the result of giving us freewill, but He did it anyway because He wanted (and wants) a REAL relationship with real people, rather than goose-stepping robots. Serious Christians believe sin is important because in the end, it’s a rejection of God. It’s telling Him we know better than Him how to live our lives. And thousands of years of history have shown how horribly wrong this is. In addition, serious Christians believe God is perfect and cannot stand the sin that all human beings commit. But rather than condemn us all, we believe God sent His son as a gift to everyone who wishes to accept the gift. And that gift (a) clears away the sin and (b) strengthens us to see our sin clearly and avoid it more in the future. Jill: But he’s God, for goodness sake. He could have created perfect beings, couldn’t he? He could have created goose-stepping robots if he wanted to, correct? Instead, he created humans with flaws, which he already knows about because he’s omniscient. Then he grows frustrated with them and causes great harm to many. Whose fault is that? Frank: Yes, He could have created perfect beings who were in perfect relationship with Him. And it would be a real as a TV “reality” show. Serious Christians believe the Biblical viewpoint that humans are made in God’s image. That means the emotions we experience are the emotions He experiences. Pain, frustration, anger, joy, etc. Goose-stepping robots would be as useless to Him as they would be to us. Jill: How do you know those are the emotions God experiences? How do you tell the difference between real emotions as God experiences them and human emotions which humans project upon God? Couldn’t “in His image” be just a physical descriptor? Or a metaphor for something else? Frank: I know these are the emotions God experiences because the Bible – which serious Christians trust as absolutely reliable – depicts God with those emotions. In addition, I guess “in His image” could be a physical descriptor because we all resemble Jesus – human beings with two arms and two legs and a face that expresses every emotion known to humans. So, what do you think? Is the idea of ‘sin’ — and the way to escape the prison it creates for every person on this earth — more real to you now? And what about that ‘escape’? Do you want to know more about it? Type your thoughts below and let’s have a conversation. 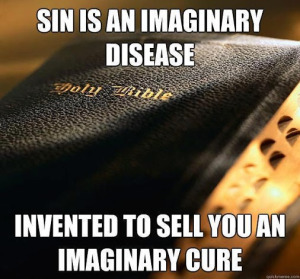 I’d never heard anybody call “sin” an imaginary disease, so when I saw this graphic posted on the Internet, it instantly grabbed my attention. 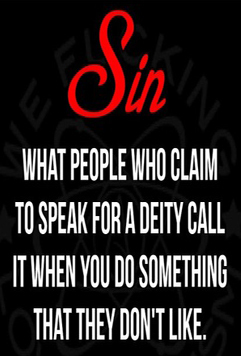 “Sin” has become a strange and cliched term in our culture. Either something is “sinful” (a favourite positive term in TV commercials for rich foods like chocolate) or it’s something most of us associate with annoying, badly dressed TV evangelists. Sin is the breaking of God’s law. If God says “Do not lie” and you lie, then you have broken His law and sinned. The reason God says to not lie, not cheat, etc., is because these laws reflect the moral purity of His nature. Therefore, the law is a reflection of the character of God. Any act regarded as such a transgression, especially a willful or deliberate violation of some religious or moral principle. Any reprehensible or regrettable action, behavior, lapse, etc. ; great fault or offense: It’s a sin to waste time. Maybe that’s not a “sin” to you. So let’s use less loaded words: Misdeed. Mistake. Error. Wrongdoing. Imperfection. Whatever your preferred term, I can’t for a minute believe it’s an “imaginary disease”. Is there even a single person on this planet who hasn’t done or said something they regret? Or NOT done or said something and regretted that? It seems crystal clear to me that this is a universal human condition. We “invented” it and, sadly, we live it out every day. So what about the “imaginary” cure? The person who created this graphic is probably an atheist and so believes if the “disease” isn’t real, then there’s no need for a cure. But if you’re comfortable in disagreeing with the former, then the latter is no longer imaginary. For people like me, the cure is wonderfully simple: Jesus Christ, whom serious Christians (and many others) believe is the son of God. Jesus is God’s gift to humanity, given to all who believe that He died to make up for our sins. All we have to do is accept the gift. Obviously, this doesn’t mean we will avoid the consequences of our actions (or inactions). But it does mean that, if we truly believe Jesus offers the way to eternal forgiveness and if we sincerely ask for that forgiveness, we will receive it from the creator and master of time, space and the universe. No matter what. So, does the cure for your “disease” interest you? Yes or no, post your answer below and let’s have a conversation.